Up until now, Cryptolume has been making use of the global market cap to provide alerts to users on the platform. This was the most simple and “guaranteed” method to provide alerts up until now. Over the past month Cryptolume has been connecting to exchange API’s and collecting data off them directly. This is the next step in providing the best cryptocurrency alerts on the market. We are now connected with 7 major cryptocurrency exchanges. In the background, we have been calculating metrics such as: Volume, Price, RSI and MACD in order to provide our users with these indicators in both a visual format (Graph App) and alerting (Slack). We have now released one of our most robust features that will give users the biggest edge possible on the market right now. So what are they? And how are they different to what Cryptolume has already been doing? Wait for the latest market data from Coinmarketcap (This can be 5 minutes delayed). 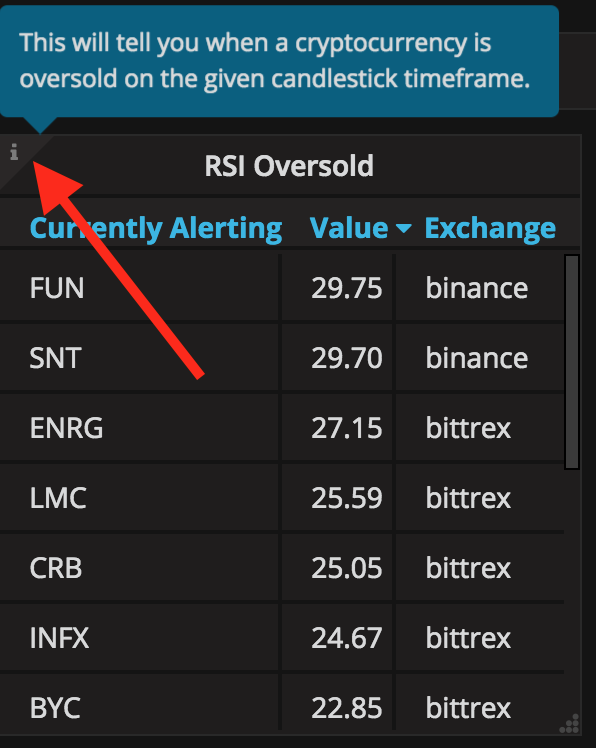 Run our calculations in the backend to produce statistics such as: RSI, Volume and Price. Allow time for this information to calculate and then run alerts. This can cause delays, and relies on all exchanges to be complete at the same time, before we send the alerts for either one of them. This has now been improved in the sense that we’re connecting to each exchange individually, and collecting the specific statistics from those exchanges and then running the calculations and producing the alerts. This is a lot faster because for example, Bittrex, Poloniex and Cryptopia take around 2~3 seconds to give us information as they are very fast API’s. This means the alerts will be sent out as soon as we collect the information and run the fast calculations on RSI, MACD, Volume and Price. Faster alert times: You will receive close to live stats of uptrends or indicator alerts on the market. We will now alert on every coin that the exchange has, meaning we’re moving away from the top 300 coins and are actually providing statistics for all of them, given they are on our supported exchange. You will now only receive alerts for the exchanges that you are interested in and the data related to that exchange only. You choose which exchange you want to be alerted for by joining the exchange specific channel. MACD is now also part of the alerts, and the reason we’ve delayed our MACD update is due to releasing this new infrastructure of our system. This all sounds very exciting right? And this is only the first step to our plans for the future. So, how do I use the new exchange based alerts? Our old alerts will still be available, however they will be placed in legacy mode. This means that it will still remain up for now, however we will cease updating it and we will work towards phasing them out slowly without impacting our users. In the specific example, I’ve typed in “bitfinex” which will show me all the channels available for Bitfinex. You will see 5 different channels, they will be for example: bittrex-5m, bittrex-15m, bittrex-30m, etc. What this refers to is the candle period, similar to our old alerts, so if you want alerts for 5 minute candle intervals then choose 5m, for 4 hour candles choose 4h, and so on. If you have any issues with this, please feel free to ask in #support channel on Slack. Just click the ones you wish to receive alerts for and then “Join” the channel. You will start receiving alerts for coins on this exchange straight away as they come. 1. How do I receive alerts for only the coins that I want? Answer: This page on our FAQ will describe how to do this. 2. I need help, can you help me? 3. Is this available for “Standard” users as well? Answer: Yes alerts are also posted on the Graph App. 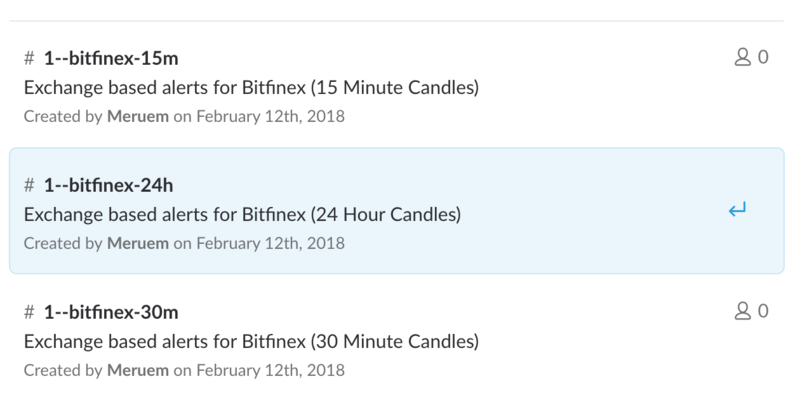 You will see them when you login on the dashboard list as “Exchange Based Alerts (5M Candles)” etc. 4. Is there more information on what the alerts do? We will be creating some more videos on this and updating the FAQ. Find out more about cryptolume and it’s features.